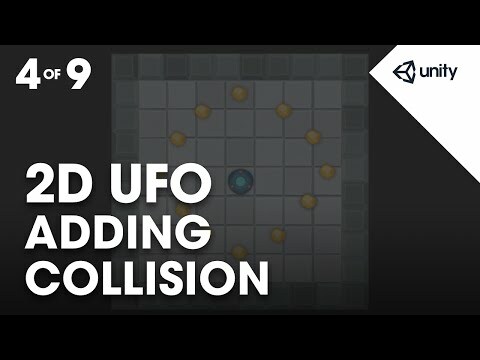 In this assignment we'll add 2D colliders to our game to enable our player to detect collisions with our environment. the collisions for our scene. Let's start by zooming out our scene view. to bring the entire background in to view. shows a visual representation of walls. the player from moving through them. They're simply artwork on a 2D sprite. beyond giving us something to look at. between two or more colliders in the scene. must have a rigidbody2D component. And so we'll be using the collider2D component. detect collisions with the environment. Let's highlight the Player game object. So we don't need to add another. in order to detect collisions. First let's add a 2D collider to our Player. so we'll use a circle collider 2d component. click the Add Component button. the circle collider 2D will appear. Select that and add it to the Player. With the collider added let's focus in on the Player. and with the Player selected press the F key. some empty space around our UFO. more or less matches the shape of the sprite. we can see that a value of 2.15 works pretty nicely. And push F to frame selected. And we'll use the mouse wheel to zoom it in. around the borders of our background sprite. Let's play the scene to test. occupying the same 2D space. and it goes flying out of the way. shouldn't be in the middle of it. with a set of smaller colliders. in the upper-left of the scene view window. take advantage of this for our game. Currently we have one collider 2D component. before we add another one. Each collider has it's own properties. to have it act as a wall. shape using the Size properties. to the size of the sprite it's attached to. of our square is already correct. and adjust the value for X.
reasonably wall-like but in the wrong position. but we need three more. to create the opposing wall. and choose Paste Component As New. the component with the same settings. to create our upper and lower walls. by swapping the X and Y values. to create the fourth wall. Let's enter play mode to test. four walls and stay within the play field. won't receive forces from one another.